A pair of Georges Perec films play at the Migrating Forms festival at Anthology Film Archives: Serie Noire at 7 p.m. on Wednesday, May 25, and Un homme qui dort at 9:30 pm the same night. And a Perec inteview in English can be listened to at France Culture; unfortunately, there doesn’t seem to be an obvious way to download it. The good people at Flying Object are putting out records of poetry at Unicorn Evil. First up: Lucy Ives. And the tireless Wolfgang Voigt has a new all-Kafka label. See also: Dirk von Lowtzow’s soundtrack for a Jan Fosse theater production. 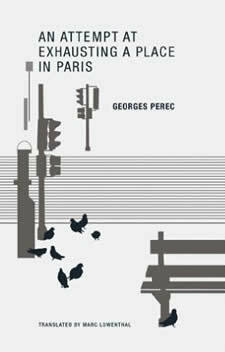 This is the third book from Wakefield Press: it presents a full translation of Georges Perec’s An Attempt at Exhausting a Place in Paris. This is a minor work in the Perec landscape, which receives only a glancing mention in David Bellos’s enormous biography. It’s encouraging that there have been a steady flow of new Perec books, no matter how small: 2008 saw Atlas publish Cantatrix Sopranica L.: Scientific Papers, and last year saw David Godine publish Thoughts of Sorts, both previously excerpted in Penguin Species of Spaces (as well as the revised translation of Life a Users Manual, of course). It’s nice seeing Perec’s books as small self-contained objects; the Penguin volume, which presents a lot of material, is too easy to skip through. At 55 pages, this book is shorter than the other two, short enough for me to read on the brief flight from Norfolk, Virginia to Baltimore, though it’s a book that demands re-reading. As the length suggests, this is a self-consciously minor work: it might be considered an investigation in boredom. Perec chose a place in Paris – Place Saint-Sulpice (visible, not particularly well, on Google Earth and visited it nine times from the 18th to the 20th of October, 1974, four times the first day, less on the following ones, attempting to write down everything he saw. The results are this book. There is pointedly nothing particularly remarkable about the location, and in his introduction Perec makes clear his intention not to write about Saint-Sulpice’s notable features: rather, Perec was attempting to find something interesting in the ordinary, a project that he’d soon expand (restricting the span of time, but increasing the space to an entire building) into Life a User’s Manual. This is a personal exercise, and because it follows his attempts over time, it feels very much like a series of notes: the reader observes the observer, and how he begins to notice things. He starts his first session by writing down all the text that he can see, then moving on to different sorts of categories (“fleeting slogans,” “ground,” “trajectories,” “colors”). Things start quickly: he’s trying to get everything down. Then there’s a slowing: he tries to notice what changes over time. For a while he’s preoccupied with the many buses that pass through the square (the second section is largely a record of the buses that pass as he watches); then he gets bored of noting the buses; and finally in in the fourth section he realizes that he can describe a bus not simply by the number of its route or where it’s going but by how full it is. It’s a tiny moment of revelation: of looking at something ordinary long enough to see something new in it. A few personal details pop up: he tells what he’s eating or drinking, and a couple of times he sees people pass that he recognizes. One wonders how personal some of the details might be: why, for example, does he mention an”apple-green 2CV” over and over? Is it the same car? Was there a reason that his attention might be drawn to this make and color of car over others? Or were there simply a lot of them in Place Saint-Sulpice in 1974? The writer is sometimes bored with his project; one wonders why he stopped on the third day. By writing on a Friday, a Saturday, and a Sunday, he’s presumably covered most of the weekly variation likely to occur; but looking longer might have brought more out. Perhaps it’s left as an exercise for the reader. Perec’s project is a generative one, of course. Reading it, I found myself thinking most often of Daniel Spoerri’s work, first his “snare paintings,” where he’d glue down the detritus of a meal to the table and exhibit it on the wall; later, he created a literary equivalent of this in his Anecdoted Topography of Chance, mentioned in Marc Lowenthal’s very nice translator’s note. In both, Spoerri was attempting to create meaning from trash; the Topography uses trash on a table to generate narrative, albeit a narrative more personal than Perec’s. Spoerri and his friends could generate a narrative from their personal trash because there was something personal that could be seized upon there: how the trash got on the table, where the trash was from. Lowenthal also mentions Joe Brainard’s I Remember, another generative trick that Perec brought into French; this also relies on the personal. What Perec is doing in An Attempt might be something trickier: he’s trying to make an utterly anonymous public space personal. It’s a difficult job: ultimately, this is more of a record of Perec’s time there over three days rather than a depiction of a place. Perec isn’t depicting the square, he’s exhausting it (as well as himself); by the end, he clearly wants to go home. This is a lonely book. I’m still kicking myself for missing MoMA’s program of Perec’s film work a few years back; I suspect that familiarity with his work in film, generally inaccessible in this country, might illuminate this book a bit more. One can’t have everything, I guess; it’s nice that we have as much of Perec’s writing in English (and in print) as we do now. Again, it makes me happy that Wakefield is publishing books like this: most publishers wouldn’t bother with a slip of a book like this, no matter how well it works. This book is as attractive as the two previous books from Wakefield, the first of their “Imagining Science” series; I’m curious to see where they’ll go with that. The paper is thick: it’s a pleasure to read. As mentioned, the translator’s note at the end of the book by Marc Lowenthal helpfully explains the text without lapsing into the overly academic; this kind of attention to detail is important, and it makes Wakefield’s work worth following. I’m particularly interested to see how their volume of Fourier turns out: but that’s next year. It’s a bit surprising to me how poorly Perec’s novels are read in this country. Everyone knows of A Void, at least by reputation, though few seem to have actually read it, or to have any idea of the reasons that Perec might have for using a lipogram in that book. There was a smattering of interest in the new edition of Life a User’s Manual, but one didn’t really sense that a lot of people were picking that up with the enthusiasm it deserves; it’s a book that people seem afraid of, which is unjust. One almost never hears anything about W, maybe because it was out of print in English for a while, though it’s an astonishingly powerful book. The book of Perec’s that one sees most often, around New York at least, is Species of Spaces, maybe because it was taken up by architects. But it’s hard to point to much recent American fiction (with the obvious exclusion of Harry Mathews) that bears the influence of Perec, which is odd: the short shelf of his work would seem to be a cookbook full of recipes for potential books. This, however, is an extremely Perec-y novel, down to its index of locations, people, and works of art; I will admit that I am a sucker for a novel with an index. (Stanley Crawford has also played with that form, in Some Instructions, and of course there’s The Sinking of the Odradek Stadium.) The novel is based around a failed film shot in Paris in 1969; the film, also to be titled Rose Alley, after the spot in London where John Dryden was attacked in 1679 by thugs who may have been hired by the libertine John Wilmot, the Earl of Rochester, who was upset with Dryden’s verse. The book has thirteen chapters, all but one based around a character associated with the film; while each chapter takes off from a character, there is no dialogue, and no sense that any action is happening in real time, and stories tend to go backwards (and occasionally forwards) in time. Each chapter is structured around a character, but not in the voice of the character. The reader has the feeling that there’s some logic structuring these episodes, but what, exactly, that logic might be is never entirely clear. One thinks, of course, of Raymond Roussel, who came up with this method of structuring a book (I presume it’s not an accident that “Rose Alley” sounds like “Roussel-y”; other echoes of Roussel can be found through the text) and his followers: there are echoes of the organization of Life a User’s Manual and especially Mathews’s Cigarettes. (Mathews blurbed the book; he also appears obliquely inside the book, when the screenwriter has a poem rejected by Locus Solus, the journal he edited with Ashbery, Koch, and Schuyler. Chapter 12 is the work’s clinamen: titled “Poet Squab”, it tells the story of Dryden’s quarrel with Rochester through what seems to be collaged text. One function of the book’s index is here revealed: some sources can be gleaned from entries such as “Burnet, Gilbert, 151 (qtd. )“: text from Burnet’s Life of Rochester appears on that page, though Burnet’s name does not. The index also allows the reader to trace narratives through the book: Chapter 6 tells the story of Wilhelmina Princep, a name which hasn’t appeared in the book to that point. Turning to her entry in the index, however, the reader discovers that she’s made eight different appearances in the text under different names. This is a carefully constructed book, and one that demands re-reading. The narrator, perhaps, might be the camera’s eye; the first sentence (and another sentence towards the end of the book, where the narrator says he’s only been to London once) might well be misdirection. 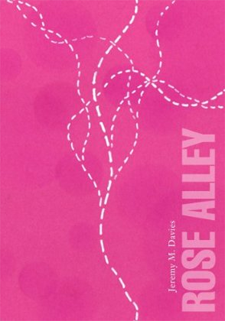 In the final chapter, the narrator describes a succession of versions of Rose Alley, all unfinished; the twelfth is the film diaries of Wexler. The thirteenth, we are led to believe, is this book, which invites careful re-reading. 106 Green, a building/gallery in Greenpoint is putting on a show based on Georges Perec’s Life A User’s Manual (up on Sundays from March 7–April 4). A fine historical essay by Robin Kinross on the problems of book glue and bindings. Ben Vershbow’s put together a fantastic online, annotated version of Candide for the NYPL. John Ashbery is in the TLS this week. William Gass on the St. Louis Arch. Joshua Beckman reviews Gabriel Josipovici’s After & Making Mistakes at the Jewish Chronicle (via This Space). Joel Brouwer on poetry books with conceptual hooks at Harriet. Georges Perec’s “Statement of Intent” (from Thoughts of Sorts) at the David R. Godine blog. “KLS: What you’re saying suggests that, in much the same way as ‘writing,’ for Derrida, has come to mean something more complicated and broader than sitting down to scrawl a pro forma note to the landlord accompanying the rent check, so ‘reading’ for you has become a more complicated and broader process than running an eye over the list of contents on the back of the cereal box while waiting for the morning coffee to drip through.